Over the years I have traveled extensively throughout Asia and I have been taken by the cultures, food, religions, diversity and beauty that countries like Korea, Thailand, Japan and Indonesia have to offer. On a recent trip to Southeast Asia with one of my best friends I was able to experience Laos. We were in Thailand for an extended period of time so we decided to take the 1 hour and 40 minute flight on Lao Airlines from Bangkok, Thailand to Luang Prabang, Laos. 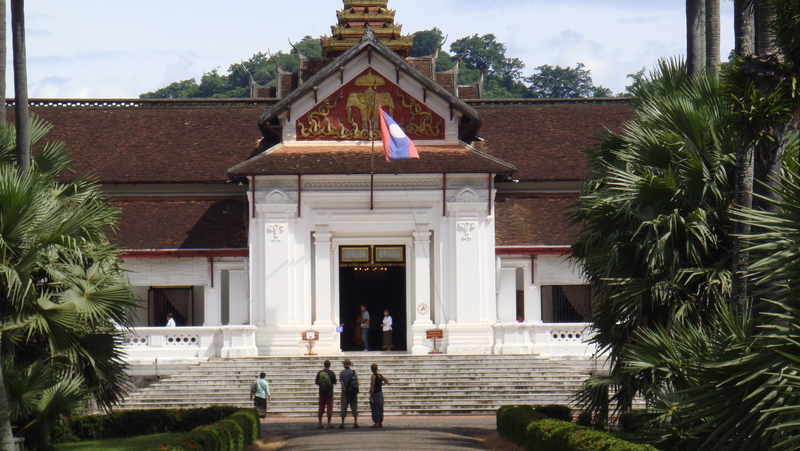 While Vientiane is the capital of Laos, Luang Prabang is the cultural epicenter of the country and is a designated UNESCO World Heritage listed town. The country opened up to tourism in 1989 but due to its’ relatively remote location and its’ UNESCO distinction, development and organized tourism has been keep to a minimum. Thankfully. 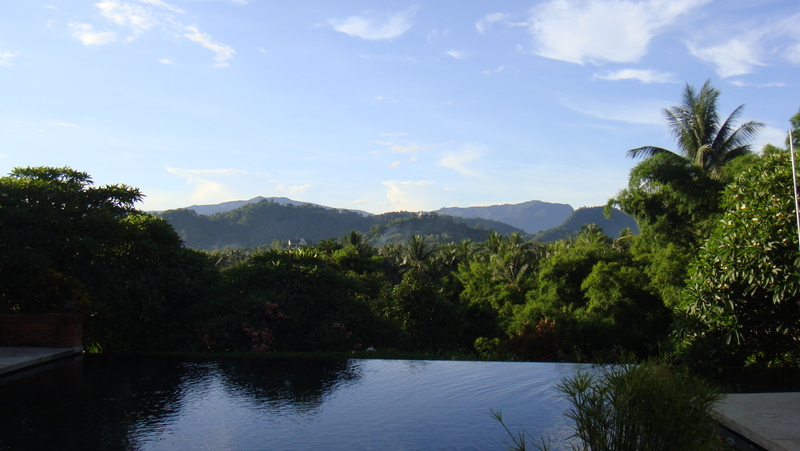 We decided to stay at La Residence Phou Vao which is an Orient-Express property situated on Phou Vao hill which means Hill of the Kites and just a few minute cab or motorcycle (yes, I got on the back of a motorcycle) ride from the heart of the town. The property is traditional to Lao architecture and is mindful of the beautiful bougainvillea, palms and frangipani that make up the dense and serene landscape. The rooms all have beautiful views of the town down below and the spa, pool and restaurant are simply stunning. After settling into our room we were asked to meet the staff back in the garden near the lobby to experience a traditional Laotian Baci ceremony which is a Shaman hosted ceremony used for homecoming, weddings, births and other sacred family events. 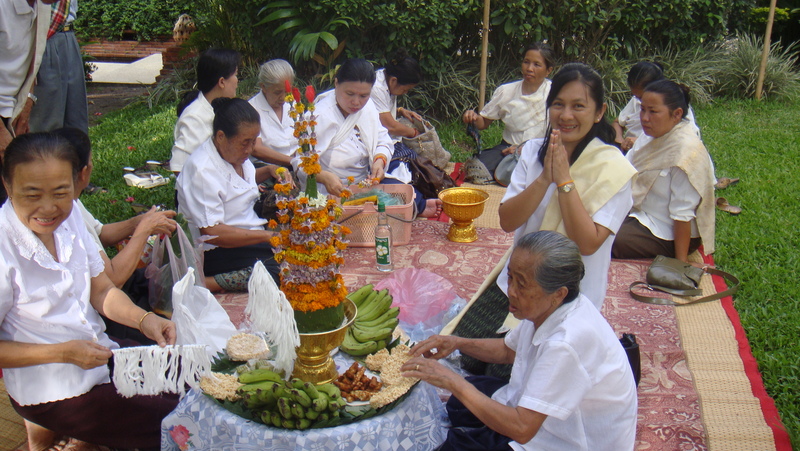 Local community members prepare food offerings, prayers and well wishes are given and a white thread bracelet is tied around your wrist to symbolize purity. The bracelets are not to be cut off and you are to wear them for a minimum of three days. This experience was simply wonderful. 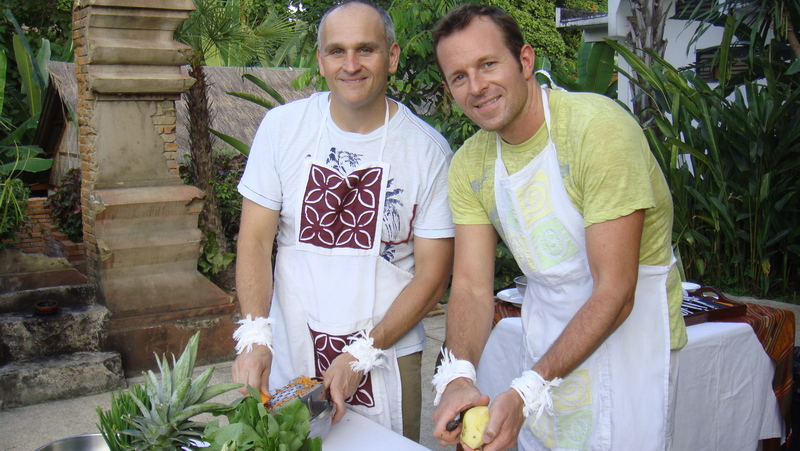 These local community members came to share their traditions and share their love of their country and each other with two white guys from the United States. We were touched and moved by the ceremony which by the way was conducted outside in 90+ degrees of heat and 90%+ humidity. We were dripping with sweat and by the end, tears. At the end of the ceremony the Shaman presented us with the large banana leaf ornament and said that we needed to keep it in our room during our stay. 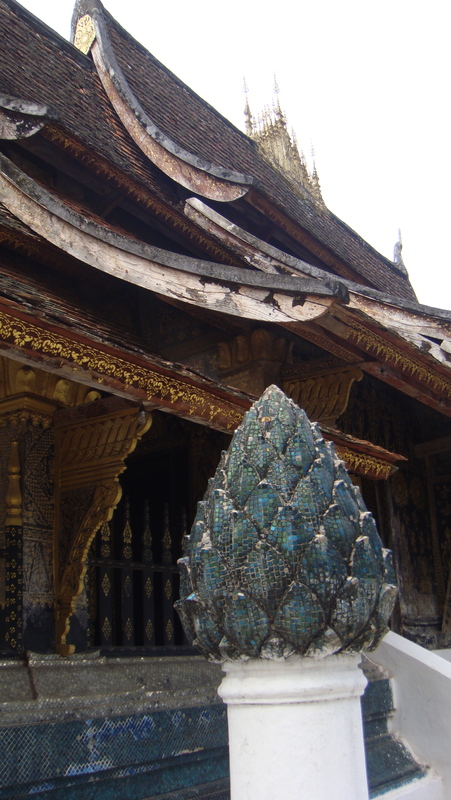 We smiled and took the ornament to our room and stared at it on our coffee table as we looked on to Luang Prabang. Beautiful. We wore our white bracelets for our entire stay and they now sit in a special box on a shelf in my nightstand to keep me safe and sound. 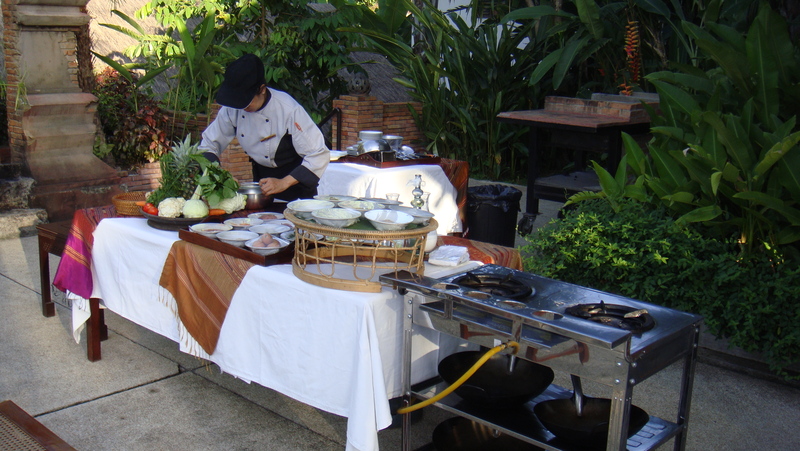 After the Baci ceremony we showered and headed poolside for our Lao cooking class. My friend doesn’t really love to cook but he was a good sport throughout the entire class in the intense heat. The hotel chef and an assistant walked us through the preparation of several traditional dishes that were filled with vegetables and had a nice amount of heat which we washed down with our amazingly delicious Hibiscus Martini’s. This was my first time having anything hibiscus and for the rest of the trip I drank hibiscus juice, hibiscus tea and several more hibiscus martinis. A must try if you haven’t experienced before. Bright and early on our second day in Luang Prabang we anxiously left the hotel property before sunrise to get a place on one of the streets in town to participate in the local Alms Ceremony. Every morning hundreds of monks from over 30 monasteries in Luang Prabang rise early and take to the streets for a collection of food that will get them through the day. 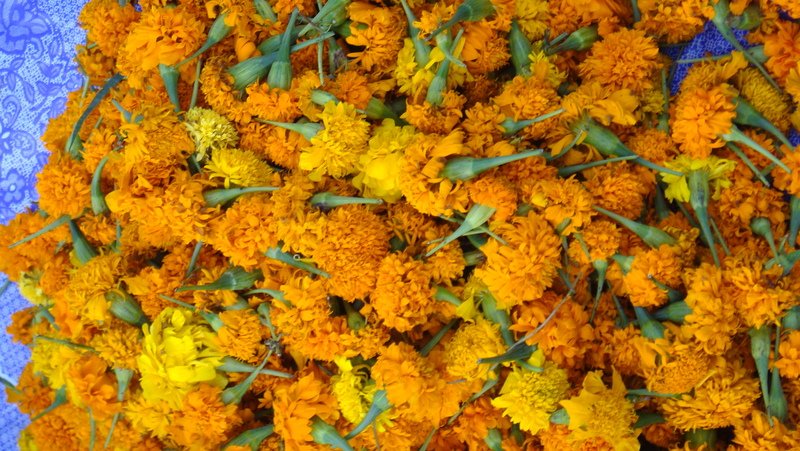 Giving an offering to the monks during this ceremony is supposed to provide you with eternal life. No eye contact can be made, no words can be exchanged and you must dress appropriately as if you were going to enter a Buddhist temple with legs and arms covered and bare feet. We got to our spot and had baskets and baskets full of rice to give to the monks and we waited in anticipation for the monks to arrive. 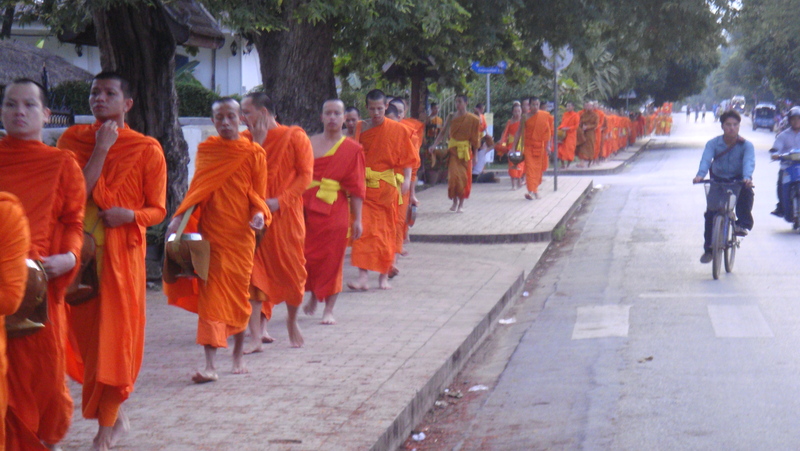 Quickly we saw a line of hundreds of monks in their saffron-colored robes coming our way. They are not able to stop as they pass so we had to get into a rhythm to try to give one scoop of rice to each monk that passed. Monks of all ages, shapes and sizes collected their meal for the day and we felt blessed to be a part of such a personal and profound experience. My friend kept nudging me the whole time we were passing out our rice because he wanted each and every monk to get food from us. He just couldn’t believe that this was the only meal that they would be given for the entire day. His love and care for others is simply contagious. After the alms ceremony we met up with our hired guide to tour the town and learn about the history of Luang Prabang and its’ people. The country was at the heart of the Vietnam War and made amazing sacrifices on behalf of the United States. 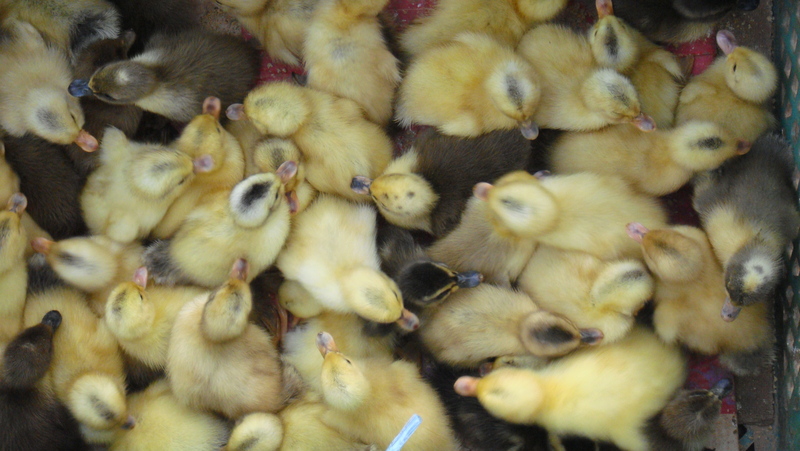 Today they still deal with the consequences of active minefields and an impoverished economy. Secretary of State Hillary Clinton was recently in Laos and you can learn more about our history and relationship with this nation by reading a New York Times article recapping her visit. From the vantage point of our hotel we could see Mount Phou Si and the glimmer of an important stupa. 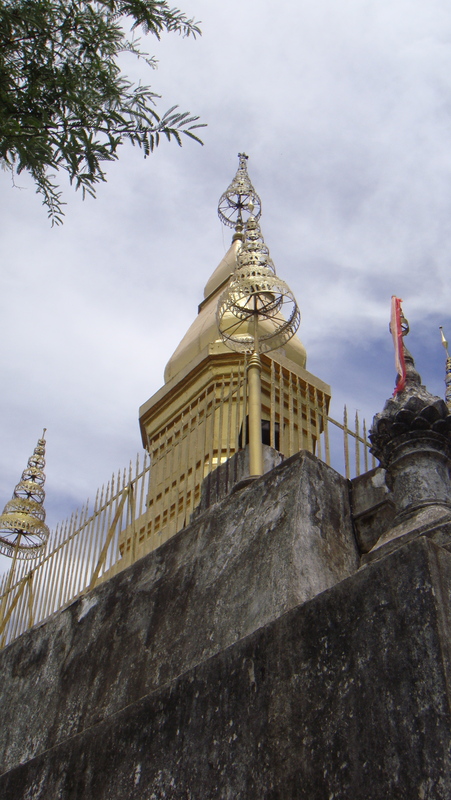 Yes, giggle, Mount Phou Si, everyone laughs about it, even the locals. We walked up the 328 steps to the top of the mountain to see That Chomsi Stupa and several shrines and buddha’s along the way. 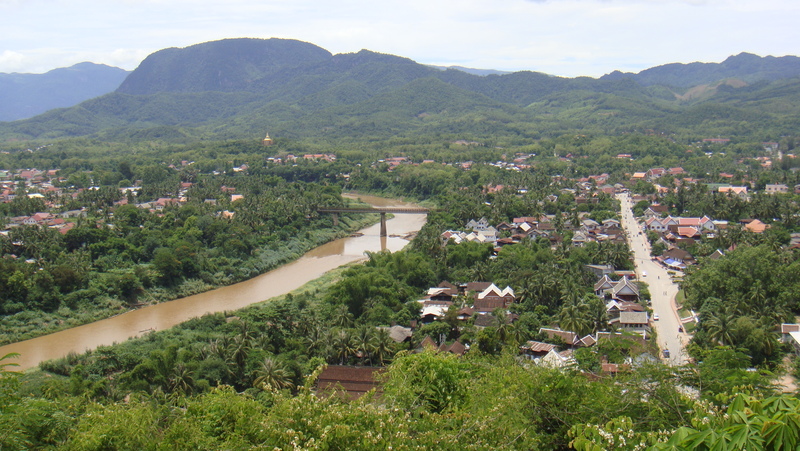 The view from the top allows you to take in the town and the murky yet significant Mekong River which was a critical waterway during the Vietnam War. Have you seen Apocalypse Now? 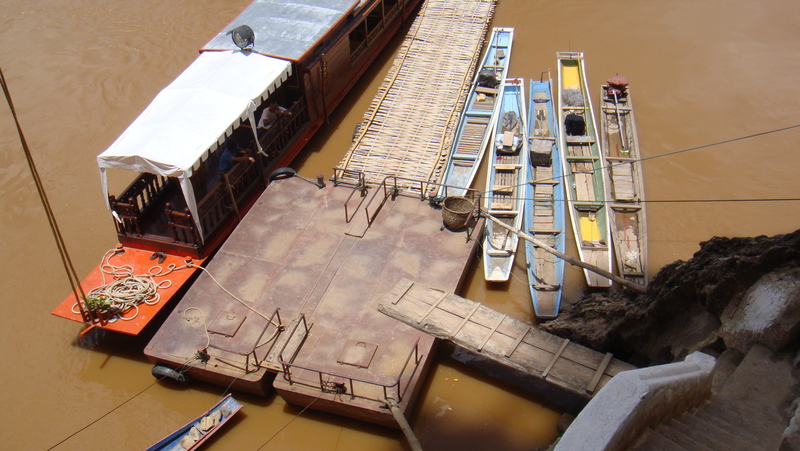 While the movie was not shot on the Mekong River it is supposed to represent events that happened there during the war. The following morning we headed to town to visit the local market that starts early in the morning and finishes by late morning. En route we stopped for a bite to-go and a coffee at a cute cafe called Joma which is owned by several Aussie expats. 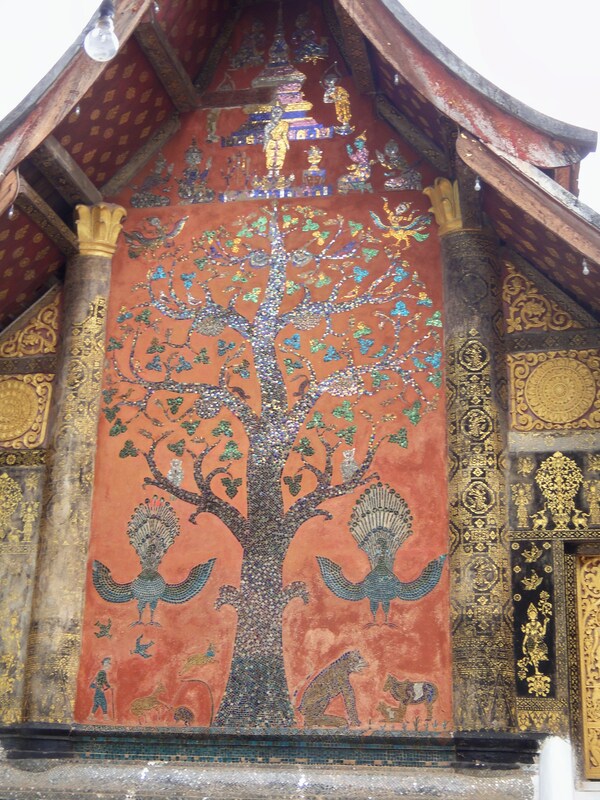 The French influence on Laos can be seen in cafes such as Joma and in architecture throughout the town. 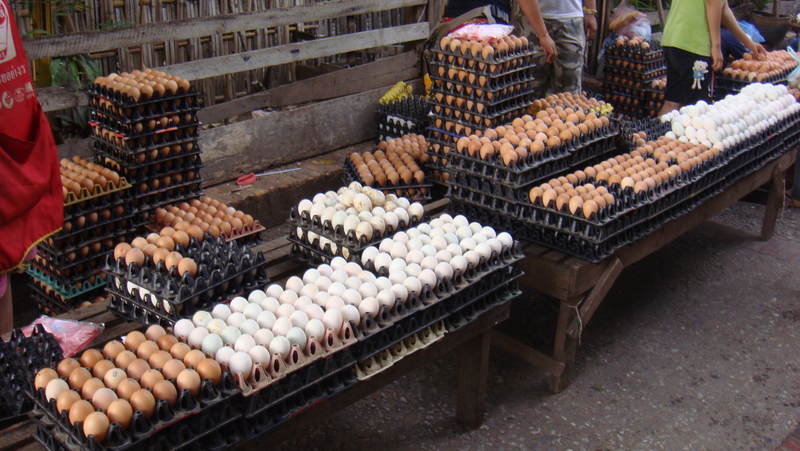 The daily market is where the locals buy their fruits, vegetables and meats for the day ahead. As fresh as can be and not presented with too much fanfare but an amazing site to see. 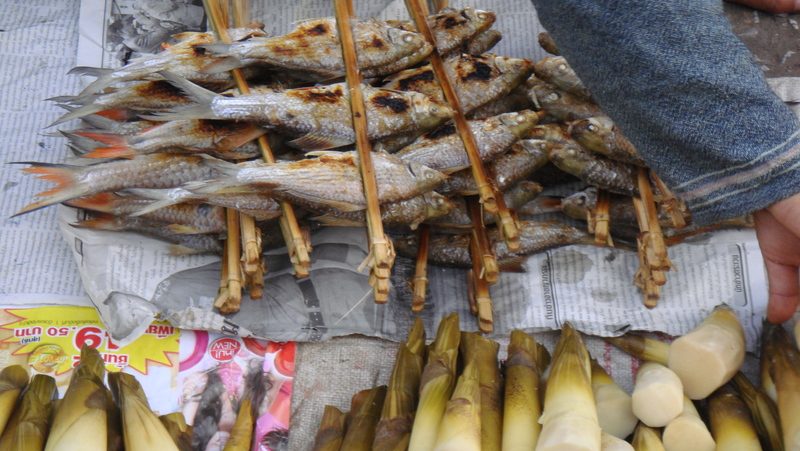 I love to visit markets to get a feel for local cuisine and daily living. Markets in Asia always come with a few surprises. 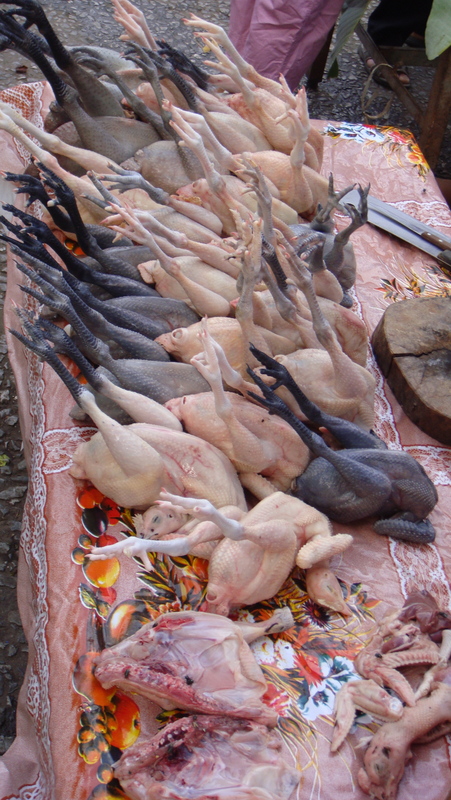 This market sold rats. Yes, rats. The kind you see crossing the tracks in the New York City subway. Well, these Luang Prabang rats are probably raised with love and care and much less dirt and trash but, an interesting choice in cuisine nonetheless. 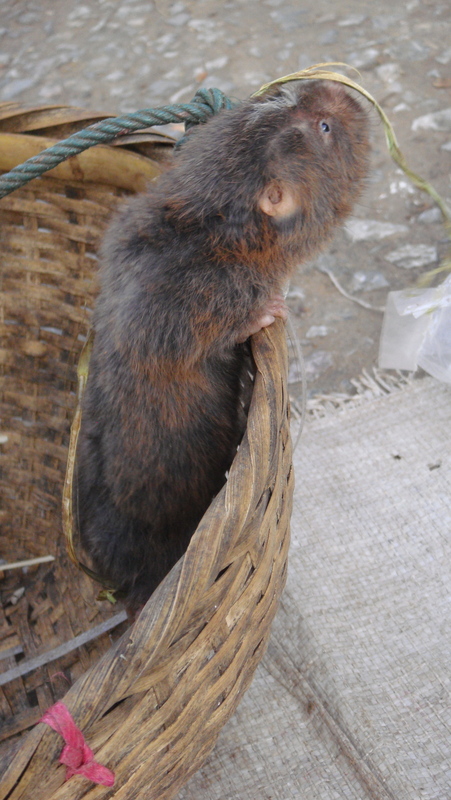 We didn’t see rat on any menus so that experience is one that I will save for my next visit. During our time in town we also stopped by the National Museum and the famous temple of Wat Xieng Thong which dates back to the early 1500’s. Later in the day we boarded a private boat that is owned by La Residence Phou Vao and headed up the Mekong River to see the Pak Ou Caves where thousands of Buddhas have been placed by locals once they are damaged and no longer wanted in their homes. 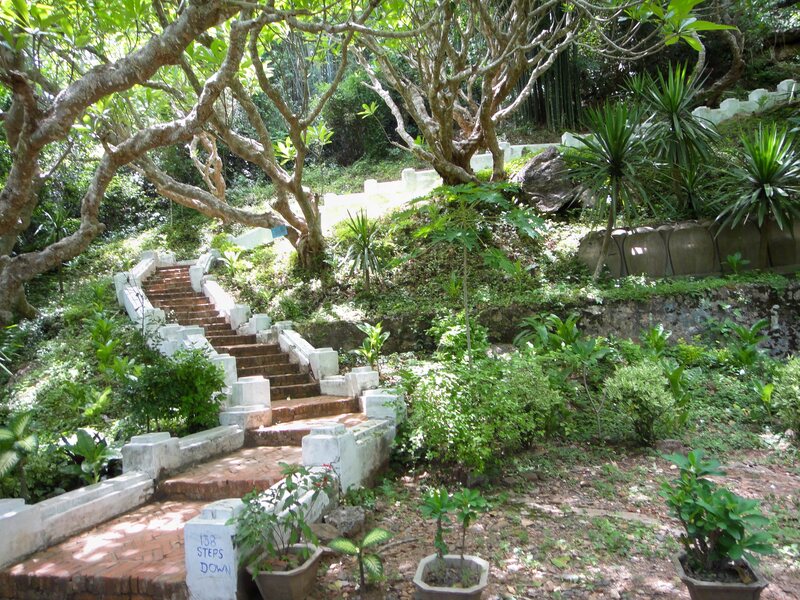 The caves are set alongside the river and after a short hike upward you reach caves that are filled with incense, candles and forgotten Buddhas as well as cool air, mystery and bats. Kind of peaceful and kind of creepy. Sort of a Buddha graveyard. The hotel set up a special lunch on a sandbar that was in the middle of the Mekong River where my friend and I enjoyed a beautiful lunch. 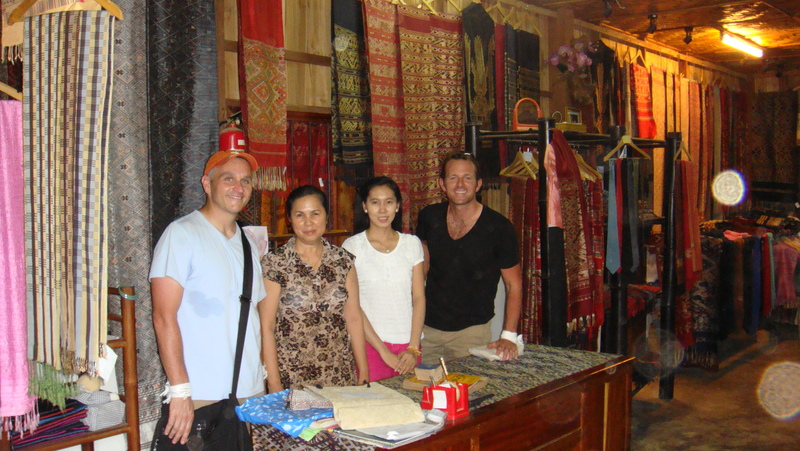 On the way back to Luang Prabang we stopped in the village of Ban Phanom where we learned about silk production and we bought some gifts for our friends and family to support the local community. 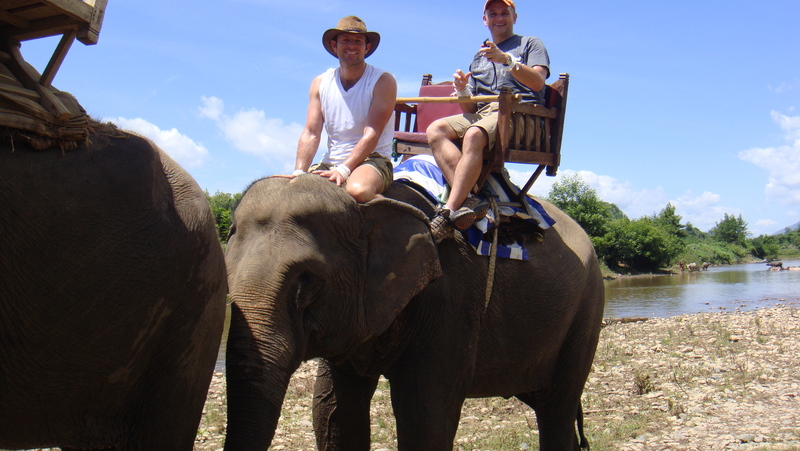 On our final day we took a long and bumpy ride outside of town to visit Elephant Village. 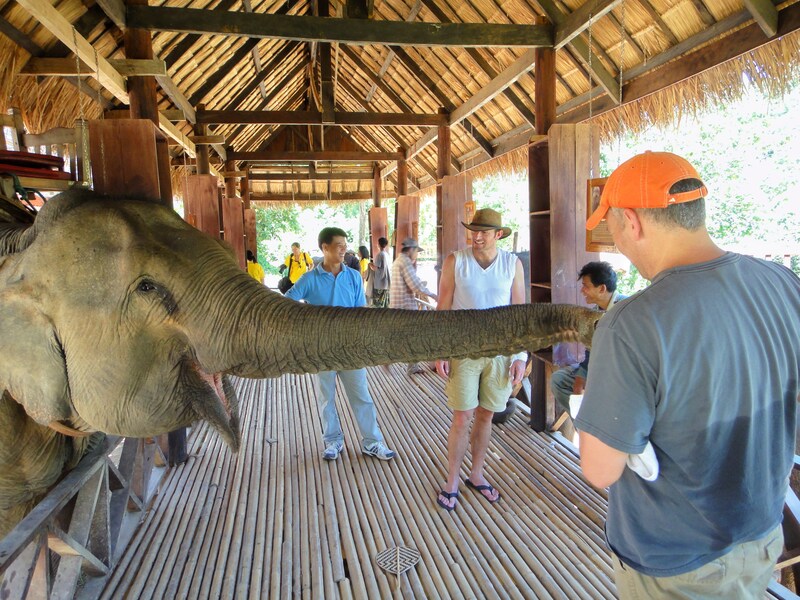 Elephant Village is a camp that works to support the local community and provide a sustainable, safe and comfortable place for elephants to live. Many of the elephants have been saved from tough labor or mistreatment and they now live a nice life alongside the river. Aside from walking around with a few humans on their backs several times a day they seem to enjoy their surroundings. 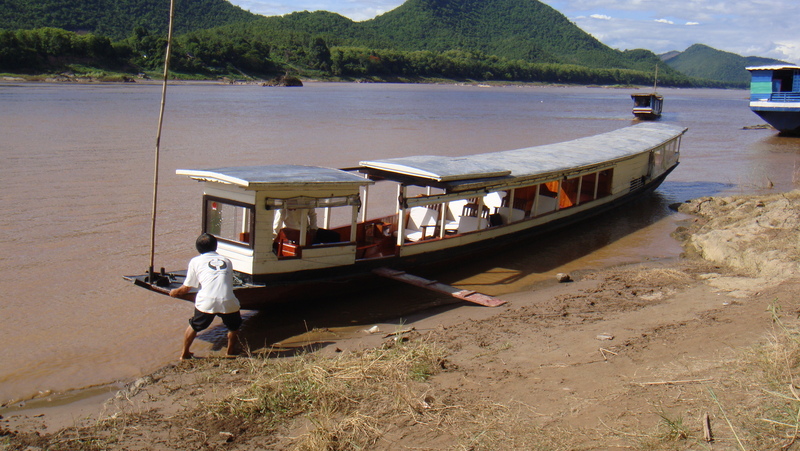 The “elephant ride” takes you up and down the steep riverside and through the Mekong River so the elephants can cool themselves off along the way. The highlight of the experience was feeding them handfuls of bananas at the end of our ride. They trumpeted and stuck out their trunks to get their “treats” for a job well done. Made us smile. 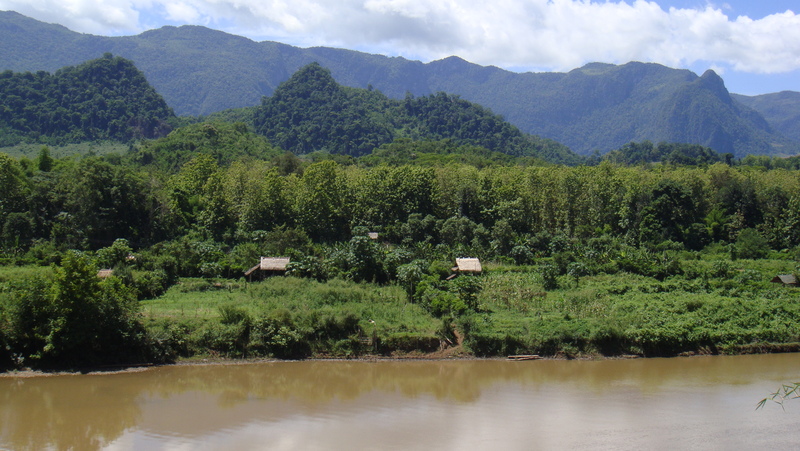 My trip to Luang Prabang, Laos comes to mind frequently and I must say that it definitely makes my favorite places that I have visited, “Top 10.” The country will make an impact on you and your soul and the people will warm your heart. 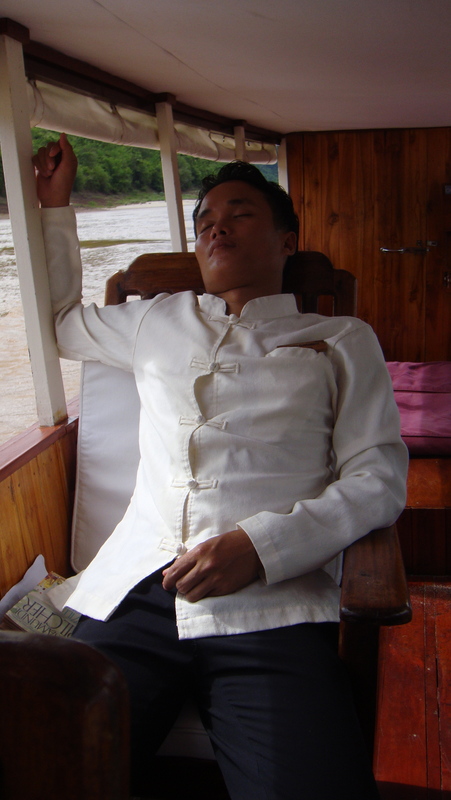 This entry was posted in Laos, Travel and tagged alms ceremony, baci ceremony, elephant village, joma, la residence phou vao, luang prabang, Mekong River, mt phou si, Pak Ou Caves, southeast asia, UNESCO World Heritage by The Style Dancer. Bookmark the permalink. What an amazing story and the pictures are wonderful! Great description. I am ready to go back. Thanks so much for the feedback Gregg. We did have an amazing time didn’t we? Such a beautiful country with warm and caring people. Next time around I will tell more about the motorcycle ride! Amazing trip! Beautiful country, culture and traditions. Beautiful pictures. Loved the market pics. Rat on a leash-crazy! Thanks for sharing. 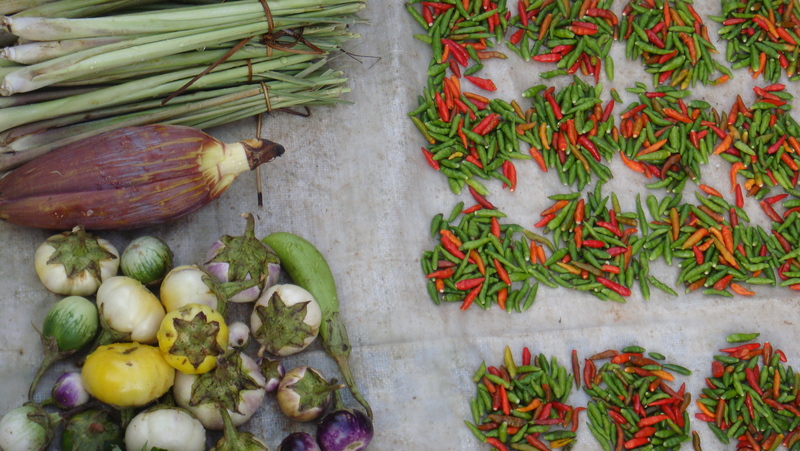 David – what wonderful pictures – loved all the colors of the market. 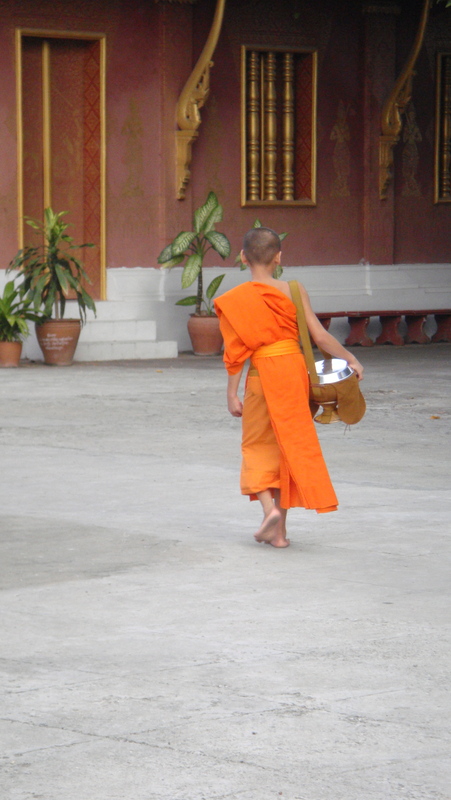 The shot of the young monk from behind is so sweet. 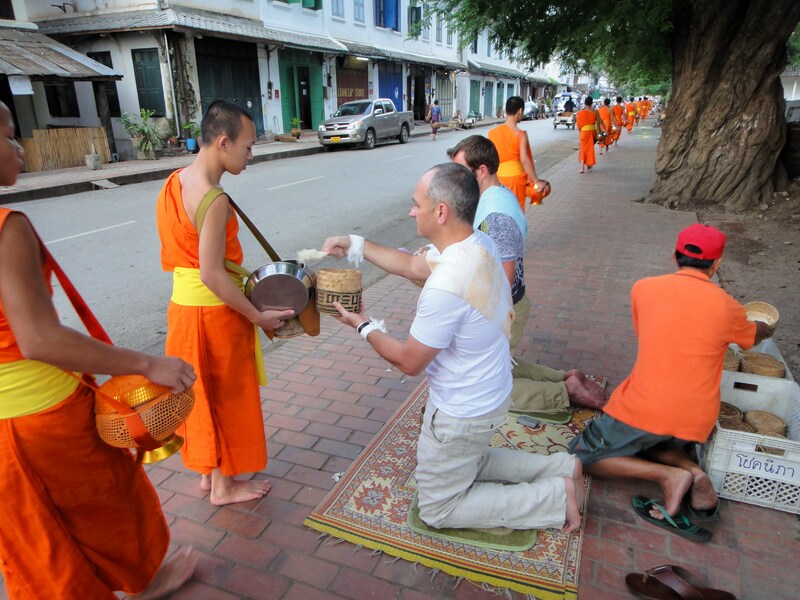 Thank you for sharing the amazing stories about the Baci and Alms ceremony and the cave of the abandoned Buddhas. All so fascinating and spiritual. 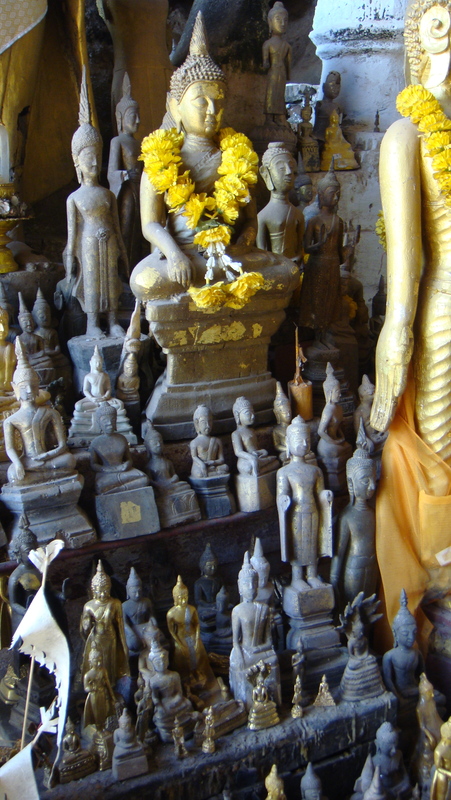 Having traveled with you to Bali I know that you can envision the spirituality of a country like Laos. People are simply wonderful. Tough to digest our past with them but the seem to have an enormous capacity to forgive. A good lesson for all of us.